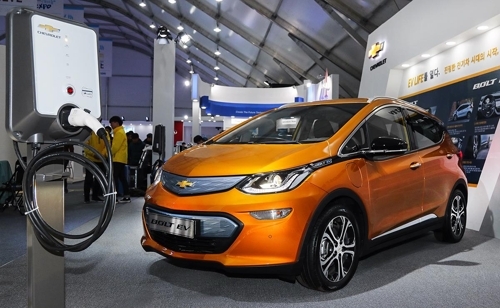 GM Korea Co. announced that preorders for the Chevrolet Bolt EV opened on Friday. 400 vehicles are set to be delivered to South Korea next month, so the company wanted to start selling them. Within 2 hours, all 400 Bolt vehicles were spoken for! Local deliveries aren’t set to start on a specific date, simply saying “April.” Deliveries are likely to happen shortly after March 31, the day the GM South Korea will officially launch the Bolt EV at the 2017 Seoul Motor Show. The Bolt EV is built at GM’s Orion Michigan plant, so each of the 400 units to be sold in South Korea needs to be shipped from the U.S.
Local pricing for the EV is 47.79 million won ($42,254 USD) but with local government incentives of up to 26 million won, customers could be paying as little as 22 million won ($20,000 USD). This entry was posted in Availability on March 20, 2017 by Admin.